You will notice two things in this picture. First I have an extra set of water bottle cages mounted low on the front racks, and second the handlebar bag is sitting on the rack, not hanging from the bar. I'll explain these one at a time. I have the Surly Front Rack. You'd have a hard time doing this with a standard low-rider rack. The Surly Long Haul Trucker comes with a third set of cage mounts under the down tube. However when I tried these the water bottle hit the front fender on turns. Maybe I needed a different cage or shorter bottle. I ended up putting my pump on this mount. However I still wanted to be able to carry more water. It's hot and dry in the western U.S. in the summer and access to water is not always assured. I have a 100 oz. CamelBack but I really don't like that much weight on my back. I had seen pictures of other people who had mounted bottle cages on the front rack so I thought I would try it. The first thing I needed was some sort of angle bracket. I had some of these "hurricane brackets" that are used in housing construction. They are a bit overkill but it's what I had. Plus they're galvanized so I don't have to worry about rust. The brackets I had were too long for my purpose so I used a hacksaw to cut them on the line shown here. I used a grinder to round the corners and then spray painted them black to match the racks and to further protect from rust. I then mounted the brackets to the rack using the same kind of nuts and bolts as the rack itself uses. It's hard to see the angle bracket in this picture but it is bolted on behind the rack. The top three, and bottom three bolts are what mount the rack to the bike. The middle two hold on my angle bracket. There was just the right amount of room for it on the rack. The water bottle cage then bolts to the angle bracket. I've been riding with two full bottles on the front and it doesn't seem to affect the handling at all. The weight is pretty low and I have small front panniers. I've seen people with large front panniers carry extra water bottles in them. I like my setup because the water bottles are easily accessible and I don't have to worry about them leaking onto stuff in the panniers. I never liked the handlebar bag hanging from the bar. It seems to affect the steering too much and also left little room to mount a stats meter and a light. I got the idea of putting it on the front rack from Ken Kifer's website . 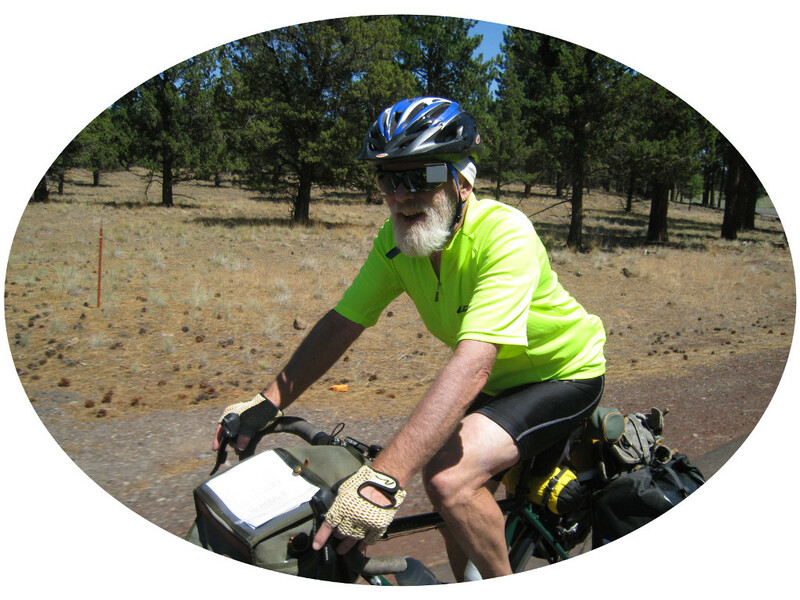 Ken was a pioneer of bike touring and his site should be required reading for anyone considering a tour. In order to put your handlebar bag on the front rack you'll need a rack that forms a platform over the wheel. A regular low-rider won't do. I had a hard time finding this kind of rack as most people use low-riders these days. Blackburn used to make one, and Tubus still does. I went with the Surly Rack since I knew it would work well with my bike. At first I just strapped the bag to the rack. This worked well but I wanted to be able to quickly unmount the bag and take it with me when I left theft the bike. I took advantage of the threaded mount hole on the rack and fabricated a wooden bracket that would mount to the rack, and to which I could attach the bag's quick release mount. I used a couple of cable ties to give my mount extra stability. This setup works great. Having the bag lower, on the rack, does not affect steering in the same way having it on the bar does. It's a little lower but I can still easily reach stuff inside it while riding.